When tasked with the responsibility of building or maintaining an RFP database—we understand the opportunity, as well as what’s at stake. True, the RFP database typically stores (think, warehouse) answers to frequently asked questions—and helps proposal writers get RFP responses and sales proposals out the door faster. Sounds elementary, right? 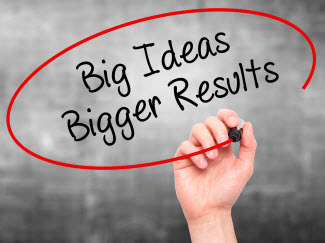 But if you don’t see the bigger picture, or if your management does not appreciate the opportunity, then your organization is missing a valuable corporate asset that others, including your competitors, strategically use to win more business. 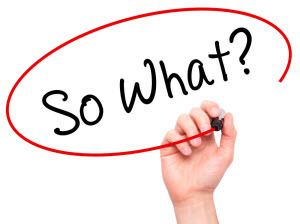 Does Your RFP Response Pass the "So What" Test? An easy way to determine if your RFP response will be compelling to a client is to put it through the "so what" test. The "so what" test is easy to understand. Here’s an example of how it works. Let’s say you're hosting your in-laws for dinner and the toilet in your bathroom is not working! You need to find a plumber. Do you care about the plumber’s certifications, training and industrial plumbing experience – or do you care that he can fix your toilet? You'd probably say “so what” to the certificates, training and unrelated experience. What compels you to hire the plumber is the benefit you will receive – a working toilet before your guests arrive. What Does Your RFP Response Convey? Let’s apply the "so what" test to your RFP response. Are you writing about your company, or about the solution that your client seeks? Years of experience – so what? That you have solved similar problems for others in the past will be more compelling to your client. Let’s face it, sometimes working with Microsoft Word is challenging. Especially when you have to edit an RFP or sales proposal document once again for formatting irregularities! It isn’t easy when you have a variety of fonts and paragraph spaces in your document. It’s frustrating when you paste a bullet list into another document, and the bullet icon and spacing change unexpectedly! Or, in your document, an important table jumps to the next page, leaving vast amounts of silly-looking white space at the bottom of the previous page. There are some days that old IBM Selectric typewriter looks real good! Well, before you go old school on your proposals, let’s understand why we sometimes long for the golden age of typewriters. Within seconds on the first business day of the New Year, I made an update to our RFP database that in the past consumed hours! With one simple update, I changed the copyright year from 2015 to 2016 across all automated sales, marketing and customer support documents that use this information. With this update, the entire team will produce documents, including RFP response documents, with the correct year! No one knew, but I was doing the happy dance. 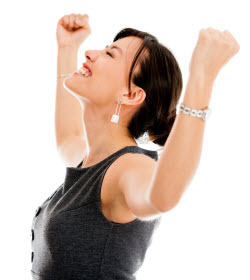 I celebrated that I did not have to undertake the arduous task of updating multiple documents and presentation slides in our RFP database, a Qvidian Proposal Automation content library. I celebrated knowing that the team will deliver the right information. For the start of a new year, new quarter, or new fiscal period, here is our checklist of Content Management tasks. 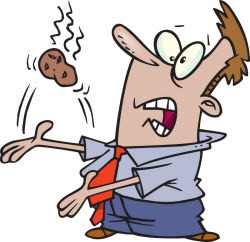 When a request for proposal—RFP, RFI, or other detailed questionnaire is presented to your organization, is collaborative teamwork in place to answer the questionnaire, or is it passed around like a hot potato? Too often, the sales rep tosses the RFP to the proposal manager to answer the questions against a tight deadline, with minimal help from others in the organization. When the proposal manager reaches out to subject matter experts (SMEs) for assistance, SMEs sometimes respond that they are too busy with "other priorities." It becomes a case of the “that’s not my job” syndrome. Why Your Proposal Format Must Support Your Brand! Your colleague hands you a cup of coffee in a generic paper cup – and you’re told it comes from your favorite, well-known barista. Do you have confidence that the coffee came from your favorite source? Will your tasting experience be tainted by being uncertain of the brand? The same uncertainty can occur with the proposals we serve our clients. Before sales proposals are delivered, clients navigate your website, download fact sheets and infographics, view video clips and attend webinars – potentially all with branding controlled by your marketing team. 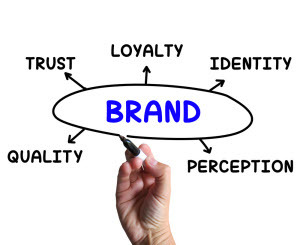 Clients experience your organization and its solutions through a defined brand. Finally, you deliver the important sales proposal. But the team has used a "creative" or unique proposal format – that is not consistent with the client’s previous experience with your brand. There can be negative consequences of this "creative" proposal branding. When delivering a sales proposal, the right solution description will ensure that your client receives the right information needed to understand your value proposition—and to select you as their vendor. Clear your calendar for an hour—and take a critical look at the solution description your team last submitted within a sales proposal. Review the description from the client’s perspective. What could the client learn from this solution description? Did it strengthen the proposal? Did it effectively demonstrate how you can help the client achieve its goals or solve their stated problems? Did the description bring all of your solution components together with clarity for the client? Here are 5 best practices to ensure the delivery of a winning solution description in your next sales proposal. To give your proposal a competitive edge, be compliant and responsive in answering your client’s RFP and proposal questions — and then include a SOLUTION DESCRIPTION THAT WINS! How many times has someone on your team directed you to just include your product description or fact sheet? Your client will know that it is just the standard product description. They might read it again. Remember, they probably downloaded the PDF from your web site, or sales delivered it as an email attachment. Since the client has already reviewed it, the standard product description does not add value to your proposal. When responding to RFPs or delivering a sales proposal, a customer-focused solution description is the right way to provide your client with the information that they need to select your offering. Automating your RFP response or sales proposal processes will be exciting for some team members. The thought of going home on time, because they can get their work done faster using RFP software or proposal software technology, provides fabulous incentive to improve existing processes! However, not every team member embraces change. Let’s face it, some people simply don’t like change. Some team members easily adapt to new technology, while others move more cautiously. Furthermore, proposal deadlines may be tight. It seems that there is always a proposal project that demands our attention and threatens process improvement. These challenges are real. With a good rollout plan for your RFP response or proposal process improvement, you can address the challenges. This is to share 5 simple tips that have helped others successfully implement technology with excellent results. Pop the champagne! At SalesEdge, we celebrate the individual and organizational success that our clients achieve using RFP response and proposal automation solutions. 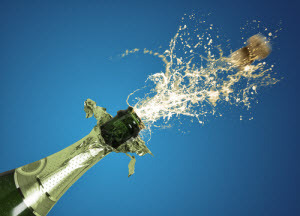 Forbes Magazine has taken note of this SalesEdge success—giving us more reason to celebrate! Kym Harrington, our president and CEO, is recognized by Forbes as a top Women Business Leader in New England.